Right Wing - Left Wing, Which feathers do I have? It's easy to determine which wing your feathers are when you compare them to the pictures on this page. Many bowhunters don't know that the difference between left and right wing feathers is that right wing feathers come from the right wing of the bird and left wing feathers from the left wing. It's that simple. 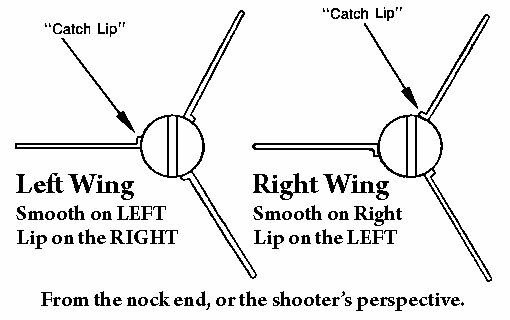 From the archer's perspective left wing feathers will induce a counter clockwise rotation and right wing feathers will induce a clockwise rotation. NOTE: When selecting single bevel broadheads, always match right bevel broadheads with right wing feathers and left bevel broadheads with left wing feathers. If using straight fletching instead of offset or helical, it's still a good idea to match the wing of the feather because feathers have a natural curvature to them and will still induce rotation. To see you you have right wing or left wing feathers, compare the feathers you have to the images below. Go to FAQ Main Page.